What is OET and what does OET assess? 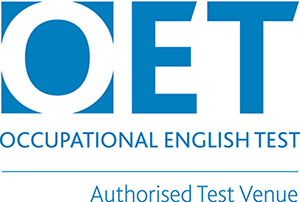 OET is an international English language test that assesses the language proficiency of healthcare professionals seeking to register and practise in an English-speaking environment. The advantage of OET for health practitioners, relative to other international English tests, is that it is contextualised around communication skills that are relevant to work in healthcare. So, test-takers are able to make use of skills that they have developed in the course of their work. Who uses OET as proof of English proficiency? Authorities in the UK, Ireland, Australia, New Zealand, Namibia, Dubai and Singapore accept OET for registration in 12 healthcare professions. Australian Department of Immigration and Immigration New Zealand accept OET for all visa categories, which may require an English test, including Skilled Migrant Category. Leading health educators in Australia and New Zealand accept OET for admission to healthcare courses. What preparation support is available for candidates? Languages International offers a 3-week course that includes 24 hours of tuition and is delivered in the evening. Go to https://literacyprofessionals.co.nz/services/occupational-english-test/ or contact us for more information. OET’s Preparation Portal contains a range of preparation materials: https://www.occupationalenglishtest.org/preparation-portal/. How can I apply for OET? Results are published online 16 days after the test and candidates are provided with login details to access a secure system to view their results, which are also sent by post.